He has hundreds of seedlings and you're telling him that's not enough? I don't even have one tenth of that and I consider that a lot. Are you guys selling your tomatoes by any chance? I don't sell any plants. I give some to friends and family but most of them will be in my garden. I always started my seeds in a 72 cell flat, but it can get pretty light consuming. If I can save myself a couple weeks on less lights, I'll do it. I do sell. But no where near what I am growing. The seed I grow and sell, I buy. If I buy the seed and save it, than I will grow it and maybe sell it, but the seed that I get from trades and gifts I keep for myself. Those I don't sell. I have so many varieties this year as I have the tomato bug big time since I discovered how good heirlooms are. I have never seen most all the tomatoes I have started and will start let alone taste them. I'll take all the ones I am growing and save enough seed to give back and share with others and the tomatoes will go to feed folks. In the fall I go around to those homebound, seniors, and anybody else that I know that might need fresh veggies to supplement their diets and give just about everything I grow away. I grow mainly for the joy and pleasure of it and the sharing. It's alot of work, but seeing the smiles on folks faces is all worth it. For me anyways. More babies! This is such a neat thread. I love getting to see all these tomatoes. It is interesting to see how folks all grow them and those that have tags, seeing new tomatoes you haven't heard of yet, but now feel the need to add to your collection. Sugar Beefsteak. Now I have to go see what it is like. All these pics is not helping my addiction. I found pencils would sometimes get stuck and rip the roots up. When doing a big tray. I slighty tip it up and use the blunt end of a small paint brush. I go along a row and pop em loose and than come back and gently pull out the ones I wanted for transplant. That way the others can grow or seed that hasn't sprouted yet can do so. That's why I started cutting them 288 trays up into sections before sowing. Cutting into 72 cell sections when you need more of the same seed is a whole lot easier to handle and you can still put all the sections into a flat to hold them. Oh your asking for a miracle. I am the worstest ever at taking pics. I'm surprised the above doesn't have finger or feet in it. What I do is get the 288 Plug trays. Here's a link. I don't know if the Mega Store has them cheaper or not. I take the trays and on the wide section I start cutting them up into sections where they are 3 cells wide and usually 8 or 9 cells long. I always have a long piece left and I cut that up too. A gallon baggy will hold two trays of the 3 cells wide by 8 cells long. Unless it a big seed , almost all my veggie and flower seeds I start in this method. Since I was growing so many different varieties this year I cut my trays up into 6 and 9 cells and a few 24 and 76 celled trays. I fill it cell with Fafard Super Fine germinating mix. It is very fine and has everything in it to start the seeds out. You usually can find it at some garden centers or if not, some will order you in a bag. The bag is 2.8 cu. ft and one bag is about 20 bucks, but will last you for years. Some garden centers sell the small about 2 quart bags. I fill the holes, take a mist bottle, actually it an old empty insecticidal bottle that got cleaned out and I give each cell two squirts of water that has a bit of hydrogen peroxide in it. Take a wooden stick or a paint brush, make me a tiny hole in the center, about 1/4" deep and sow one seed at a time. It's a great way to relax. Once the seeds are in, I just cover with tiny amount of fine grade vermiculite. If I'm out of vermiculite I just add a tiny bit more seed starting mix and give one more quick squirt of water. I cut up blinds and use two at opposite ends of each little seed tray. Stuff them in the gallon baggy. I start closing the baggy at opposite ends. When I get to the middle I hold the baggy there with my fingers and blow into it to blow it up. Makes a nice little gh effect. Than I just put the trays on the kitchen table and I have an over head light that stays on 24/7 and I just wait til they seeds sprout. I do not use heat mats or anything like that. The heat from off the old-fashioned 60 watt lightbulbs works just as well. I just have to watch the seeds don't sprout and start stretching on me. Tomatoes no problem as they can be buried deeper. I have to check for sprouting constantly. Once they start sprouting, more than one or two, than I remove the trays and place them into a flat that has a cut up white kitchen trash bag in it. Like what you see in the first pic. That keeps the bottom of the seedlings roots from drying out and makes them start forming rootballs inside the tiny cell. I can stuff a cut up 288 cell tray of assorted cultivars and varieties in one tray. Saves on a whole lot of space when you wanting to start hundreds of types of seeds and I can fit 4 seed trays, that over 1,100 seedlings, once out of the baggies under two of them think it 4' indoor/outdoor grow lights. Also once they under the lights than I just water along the sides of each cell with a $1 plastic ketchup bottle from Walmart. I can water all the trays in a matter of minutes. Once they been under the lights for 7 days than I start adding tiny pinch of MG to water bottle, just a few grains. Evey time I transplant, I wait 7 days before I start adding ferts. Once sprouted they go under the lights on the plant stand til they have their first true set of leaves, sometimes I wait til they have two sets of true leaves, just depends on how busy I am and then I start transplanting. I transplant into the tiny bathroom plastic cups and I can get 50 of them cups on a flat to put under the lights til they ready to get transplanted into 3 or 4" and out the door. My method is not for most folks. It too time consuming for them. But it was the way I was taught by my mentor, and his mentor who was P. Allen. Smith . The only thing is every few days til the seeds sprout I open the baggies up and let old air out and new in and blow the bag back up. If I see to much humidity on the top of the baggy, than I take seed trays out and put in a new baggy and wash old one and dry for another set of trays. I have it down to two squirts of water per cell because I found more than that and you can possibly mold your seeds. I been using these trays and same method for years and years. I still get tomatoes and peppers and other flowers. Just repotted mine yesterday for the first time! I'm growing some for friends and family this year too, and I don't have enough room! I'm keeping the black pots for myself, the tan and green ones will be leaving for new homes soon. I'm going to have to rotate top and bottom shelf! These guys are just over 4 weeks old. I think it is mighty nice of you to share your harvest with seniors and the needsy. That's the true spirit of gardening. You made me very proud to belong to this Tomatoville community. God bless you for all your good deeds and your kindness! 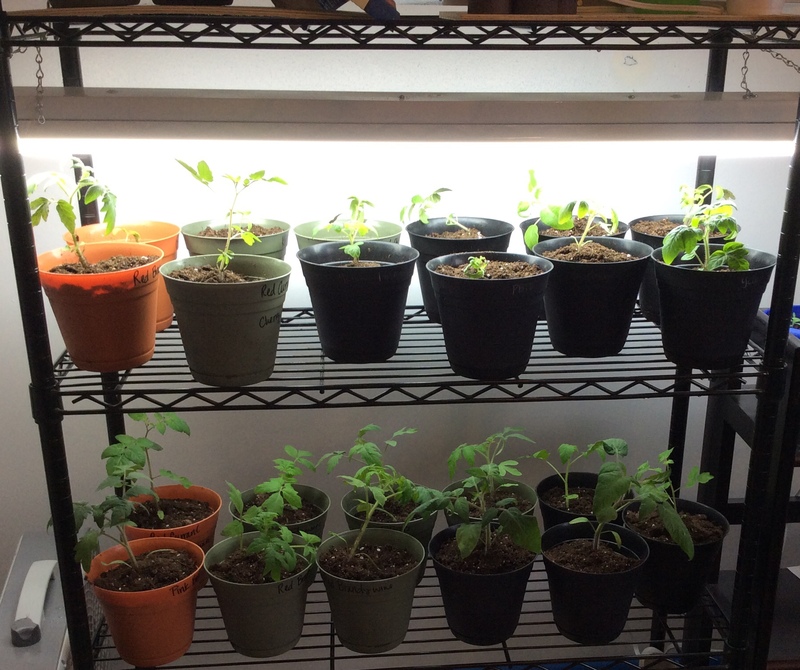 First 2 pics show some of the tomato plants growing inside under lights- sown on 3/3 and 3/12. Last 3 pics are of 6 cherry varieties (Aiaparl, Ditmarsher, German Extreme Dwarf, Jagodka, Pearly Pink Orange, Russian Cherry) sown on 2/18 and now growing in the greenhouse. wow, these babies are just beautiful and so healthy !!! I've got ten tomatoes and peppers that are WAY too big for their solo cups and I'm starting to get them into their final homes. Most of these will live on my south-facing porch and be carried inside at night until June. Some will probably go into Walls O'Water in the garden. I wish I had a GH! Most of my "main" garden plants are still really tiny and just under lights. Some haven't been started yet. It's usually not safe until early June around here... we're still in the 20s at night. I'll post some more pics in a week or two though! I love seeing the photos, it makes me smile and think of the glorious possibilities of SUMMER... warmth, sunshine and lots of tomatoes! These are just terrific plants. congratulations on your beautiful plants. Some are already bearing fruits. I thought Nevada was hot at this tome of the year. Am I wrong? I love the colored pots. Makes the plants look happy and festive. All that color should put a smile on somebody's face. Oh! How do you even pronounce those names. What is their country of origin? Both of those are a mouthful to try and say. I thought Nevada was always hot too. Most people think that Nevada is all like Las Vegas... it isn't! I live in Northern Nevada and it is HIGH desert. We're at nearly 5,000 feet at the base of the Sierra Nevada, on the Eastern side, in its rain shadow. I'm less than an hour's drive from the North shore of Lake Tahoe. Our winters are cold, very windy and usually snowy, although we have been in a drought so just cold and dry for the last couple of years. It's windy most of the time year-round. It's extremely dry here, and in the summer it's usually around 5-7% humidity, and we get 40-50° temperature swings most of the year, including in Summer, so it will swing from 50° at night to 100° in the daytime. Now? Mid-20s to mid-60s. When we moved here, somebody told me that it has snowed here every month of the year at some time in the past. I believe it too! According to the charts, we have about 109 frost-free days per year. That's early June to mid-September or so. Right now, we're experiencing the usual roller coaster temperatures. My broccoli is now dead, despite my covering it because we got three successive nights below 25° when a strong cold front came through. The kale and chard both look okay. Nothing else is out. Not even a tomato in a Wall O'Water. Too risky. Did I mention that I really want a greenhouse? Kath, those are nice looking starts.